It’s easy, cheap, oh so yummy and you can adjust it perfectly to your taste! No more hours wasted in the grocery store because you just can’t decide whether you’d like fruit OR berries OR chocolate OR nuts. Now you can have all! 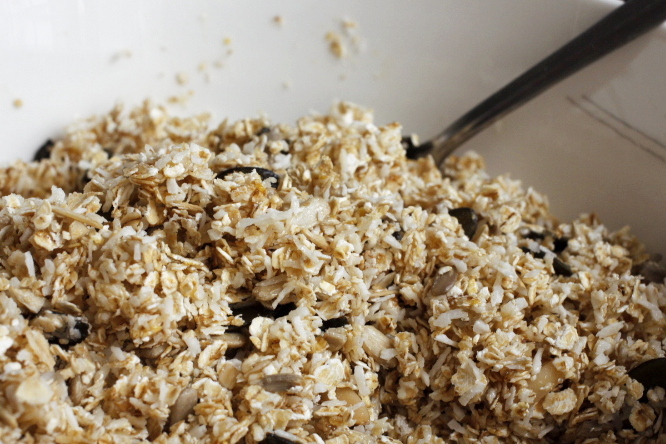 Anyway, I will now show you how to prepare the granola base, and then you can let your imagination (and appetite) run totally free and do wild and exotic combinations like chocolate-nut-granola. 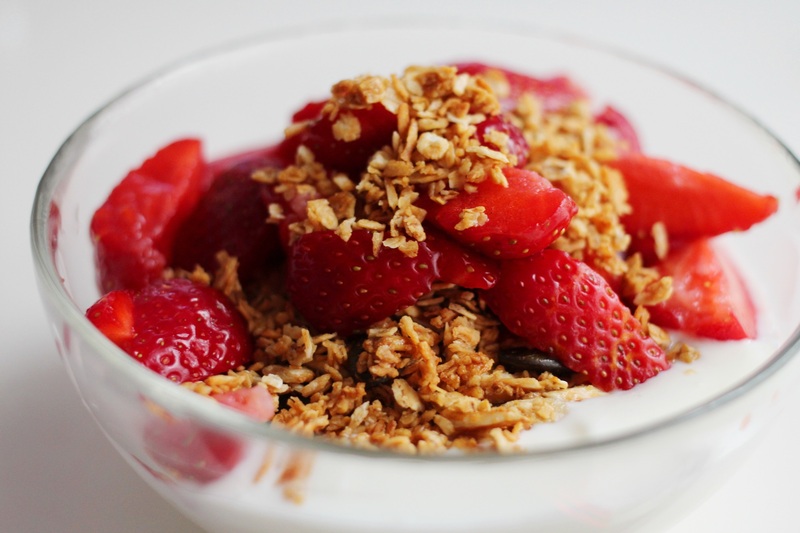 Or fruit-chocolate-granola. Or fruit-nut-granola. Man, I always wonder how I get these fantastic, innovative ideas. 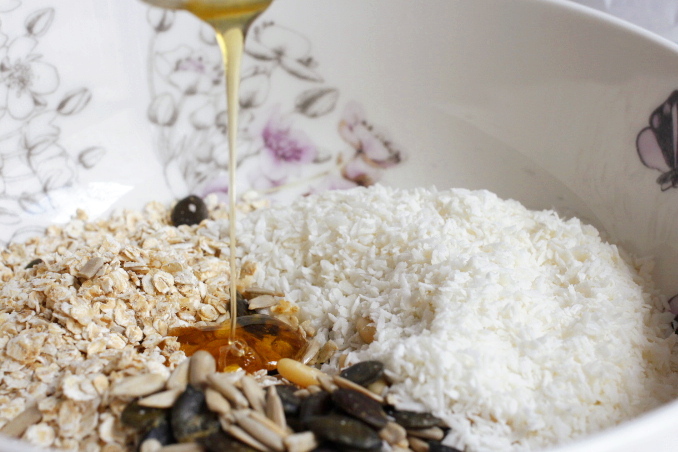 You simply start with oats, coconut flakes, salt and seeds (I use pumpkin, sunflower and pine) and add oil and honey. Then put it on a baking sheet lined with parchment paper and bake it for 45 minutes at 140°C (280°F) until it has a nice golden brown color and your kitchen (or in my case the whole apartment) smells super duper delicious. Take the baking sheet out of the oven every ten minutes or so and mix and flip the granola, so that it gets crunchy from every side. Let it cool completely before putting into a container or mason jar, otherwise it will get soggy. 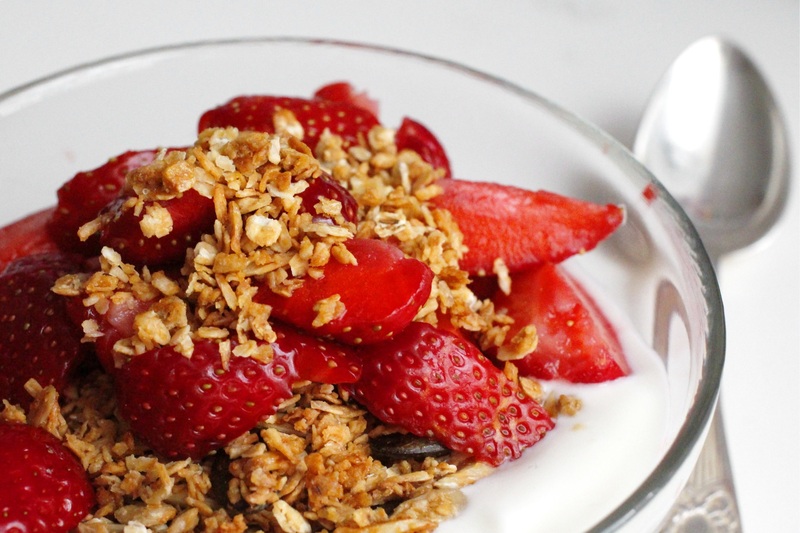 Cut up some strawberries and enjoy your granola fresh from the oven on yogurt, or put in whatever ingredients you like. Dried fruit and berries or chocolate chips, for example. Or roasted nuts (you can also bake them with your granola), or mix some cocoa powder into the „dough“ before baking! 200g dried fruit / berries, nuts or chocolate chips Preheat your oven to 140°C (280°F). 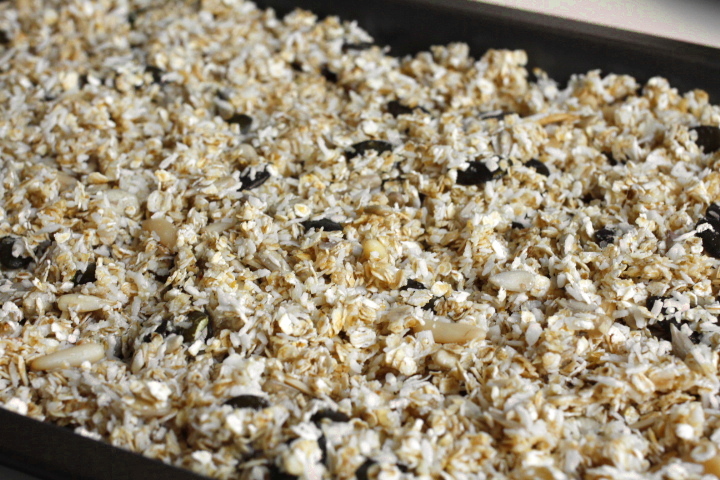 Mix oats, seeds, coconut, salt, oil and honey (mix in cocoa powder for chocolate granola) and spread on a baking sheet. 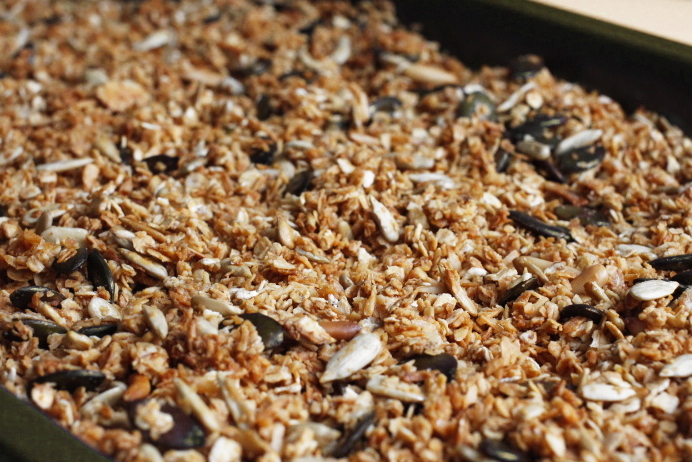 Bake for 45 minutes, mix and flip granola every 10 minutes to bake evenly. Let cool completely and mix in about 200g of nuts or fruit/berries, or some chocolate chips. 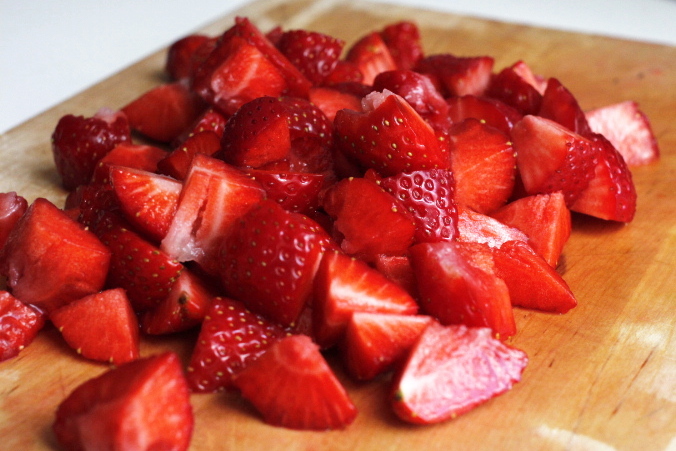 Enjoy along with fresh fruit, milk or yogurt.